Blood-stained national ID papers and voters' photos are seen on the ground outside a voter identification card center after a suicide attack in Kabul, April 22, 2018. A suicide bomber struck a distribution center for Afghan voters’ identification cards Sunday morning in Kabul, killing at least 57 people and wounding more than 100 others. Clothes and sandals are seen at the site of a suicide bomb attack in Kabul, Afghanistan, April 22, 2018. 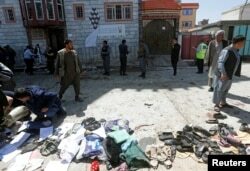 Afghan Chief Executive Abdullah Abdullah has condemned the "terrorist" attack on the center set up in a Kabul school. “I stand with those affected by this coward attack. Our resolve for fair and transparent election will continue and terrorists won't win against the will of the Afghan people,” Abdullah wrote on his official Twitter account. FILE - An Afghan employee of the Independent Election Commission registers a resident at a voter registration center for the upcoming parliamentary and district council elections in Kabul, Afghanistan, April 18, 2018. The U.S. ambassador to Afghanistan, John Bass, issued a statement following the attack: "I strongly condemn this morning’s suicide attack . . . in Kabul and offer my condolences to the victims and their families. This senseless violence shows the cowardice and inhumanity of the enemies of democracy and peace in Afghanistan." But Taliban spokesman, Zabihullah Mujahid, in a statement said it had no role in Sunday's attack. Meanwhile, Afghan officials have confirmed that bomb went off near the provincial capital of northern Baghlan province, killing at least six people, according to initial reports. Provincial police spokesman Zabihullah Shujah told VOA the blast in Pul-e-Khumri was caused by a roadside bomb and there was no immediate claim of responsibility.